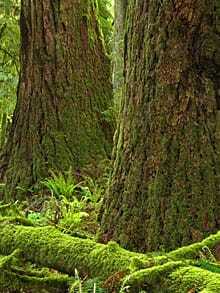 The large stand of 800-year-old trees in Cathedral Grove is part of MacMillan Provincial Park, on Vancouver Island. The park is located along Highway 4 en route to Port Alberni. 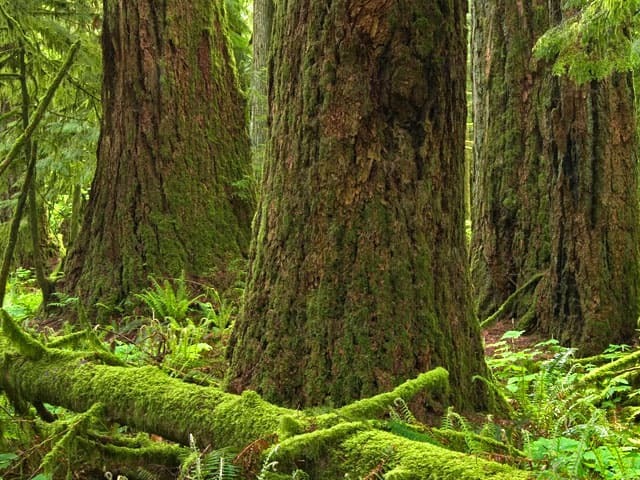 A walk through the meandering trails winds through some of the biggest trees in Canada, leaving awe-struck visitors with a lasting impression of these mighty giants. For me, this preserve of Douglas Fir captures the essence of the westcoast rainforest experience in all its beauty and mystique. The salient feelings of majesty and smallness that come from being enclosed under their towering canopy has to be a living part of the Canadian landscape. As the gateway for Canada's only rain forest, and of the few remaining old growth forests, Cathedral Grove inspires with both beauty and simplicity. There is a sense of calm and wonder when one looks at these trees - even the shadows of these trees (which indeed earns the name "Cathedral"). The silence of this great forest, and the sound of water streaming by, serve as a reminder of what the land once was - and still could be. British Columbia's rain forest is one of the most beautiful areas I've seen in the world, and truly deserves to be named a wonder. It also deserves to be protected - deforestation threatens this very wonder as I write this. Forestry is one of the most influential industries in the Canadian economy, both past and present, and will continue in the future. In this park, one sees the great firs (some aging 800+ years old) that helped shaped many aspects of Canadian culture.